A precious metal which has over 80% of its annual production coming from just two countries? Known by the Spanish Conquistadors as “little silver,” is considerably rarer than its cousin, platinum, yet sells for barely half as much? Like silver, a “two-doors” metal, with both vital industrial applications and increasing investor interest? And like these metals, it can be bought and sold by investors in the form of bullion coins and ingots? Its better known cousin, platinum, also suffers from a supply-demand imbalance, which over the next few years should take its price much higher. However, palladium, which now trades at $600 per ounce less, yet can be substituted for most of the roles platinum fills makes it an investment option with perhaps even more lucrative potential. Most of the world's palladium (85-90%) comes from just two countries – South Africa and Russia. South Africa faces ongoing labor strife – don't expect the recently settled strike to be its last – and rapidly increasing energy costs as it digs ever deeper to reach the narrow vein structures typically hosting Platinum Group Metals' (PGM) deposits. Of the remaining sources, North America and Zimbabwe account for just 4% each. Palladium's largest demand component is for automotive catalytic converters. In an extraordinary development auguring for increased usage, China recently announced its intention to take at least 6 million vehicles off the road by the end of 2014, because they do not meet current emission standards. Use in jewelry is palladium's second demand component, then electronics/dental, and finally investment demand. The advent of exchange traded funds (ETFs) which hold physical metal based upon investment purchase of shares has added a relatively new element to the supply-demand equation. Not to be left behind is the physical purchase of palladium by investors, which as the word gets out is showing increasing strength. In most mining operations, because the primary ores mined are nickel or platinum, palladium production plays “a supporting role” of 7-12% of the ore's total value. For example, take Russia's massive Norilsk production complex. Though in the past it has been one of the two largest palladium producers on the globe, the majority of its refined ore is actually nickel and copper! 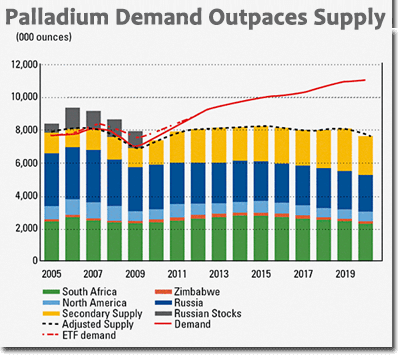 Thus palladium is relatively “price inelastic” – meaning that a significant rise in price won't translate to a big increase in the available supply. This is an important consideration for investors, because it is just one more reason why the current bull run underway in palladium has the potential of lasting longer – and moving higher – than most market watchers currently believe is possible. And this secular bull move in palladium prices could last well into the next decade. …over the next 12-18 months, an evolving supply-demand imbalance in two precious metals is likely to evolve into a price explosion. In terms of the scale and violence at that time, this may appear to be a secular price blow off. But more likely, they will have merely established a penultimate or secondary top, with their own final all-time highs registered later, around the time that gold, and especially silver, reach the public mania stage. Because they are likely to precede the final convulsive rise of gold – and especially silver, by some time – perhaps as long as 2-3 years, their price behavior may offer an important “preview of coming attractions” for the astute investor. Actions on the [palladium] charts may tip us off in advance – presenting a mirror image of how silver's final price surge is likely to look. With palladium's breakout above $800 this spring, the move I foresaw now appears to be getting underway. In the following chart, you will notice several sharp price drops which no doubt flushed a number of “weak hands” out of their leveraged positions. Yet each decline was followed by higher prices. The most recent drop of almost $40 was due to the announced settlement of the miners' strike in South Africa. But keep in mind that during this 5-month strike – the loss in new supply was on the order of 5,000-10,000 ounces per day! If demand from both industrial and investment users continues as has been the case over the last few years, a resumption in production will have but a marginal effect on the bullish case arguing for much higher PGM prices. Every so often a convergence of events results in a seismic shift, a tipping point, or simply an abrupt change in outlook. Such can occur unexpectedly with surprising outcomes even when signs of change are obvious. 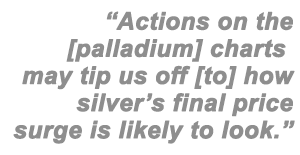 We call this being blindsided, suggesting a lack of attention… But whatever it's called – game change; tipping point; defining moment – a market re-rating for palladium is underway in which a new equilibrium between platinum and palladium will emerge. Stillwater Mining gets it. Industrial users get it. Investors in PGM ETFs get it. Shouldn't you consider getting some palladium for yourself?